Enriched with Keratin. Created by nature, presented by Hollywood Beauty. 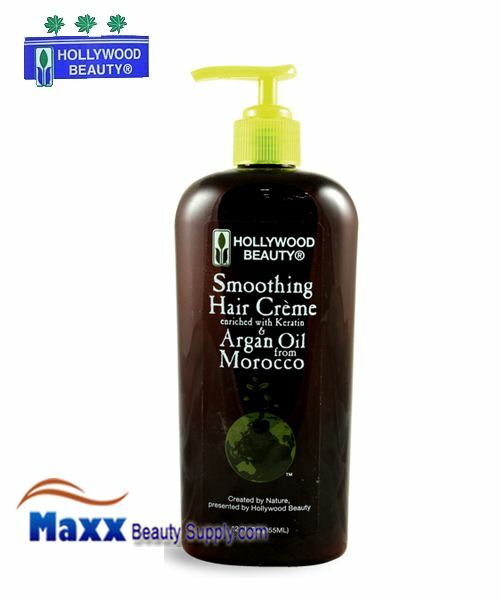 Hollywood Beauty Smoothing har creme enriched with Keratin and Argan oil from Moricco, provides your hair with silkiness, enhanced shine while helping to eliminate frizz. Apply a small amount to towel dry hair, and work evenly throughout. Leave in and proceed with styling. Water (Aqua), Glycerine Soja (Soybean0 Oil, Stearic Acide, Glyceryl Stearate, Butylene Glycol, Dimethicone, PEG-100 Stearate, Cyclopentasiloxane, Argania Spinosa Kernel Oil, Cetyl Alcohol, Keratin, Cetrimonium Chloride, Polyquaternium-7, Hydrolyzed Keratin, Trimethanolamine, Fragrance (Parfum), Carbomer, Methylparaben, Propylparaben, Ribes Nigrum (Black Currant) Fruit Extract, FD&C Yellow No. 5, D&C Red No. 33.